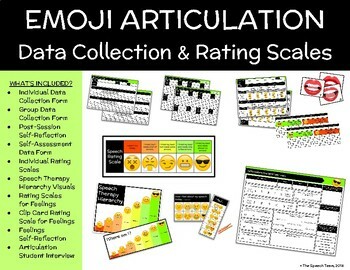 All the data collection forms and rating scales you will need for your speech therapy sessions with fun Emoji visuals!!! I feel like I am always trying to incorporate activities for students to self-assess their speech and increase overall awareness. I think the students are much more willing to buy-in to what we are doing when they take ownership of our sessions and begin analyzing data right along with me. With the speech therapy hierarchy visuals and various rating scales, I feel like overall student engagement has been increasing in my speech groups. I hope to continue adding to this product, so the price may increase over time. GET IT NOW!